With unemployment approaching 27 per cent, Spain has seen no shortage of huge demonstrations - the latest of which led over half of the country’s teachers in a nationwide strike over austerity. Organizers for Thursday’s demonstrations, which led to mass actions in the capital Madrid as well as Barcelona, Seville, Valencia and Zaragoza, reported up to a 70 per cent turnout by Spain’s teachers, though the country’s education ministry put the figure at 20 per cent. 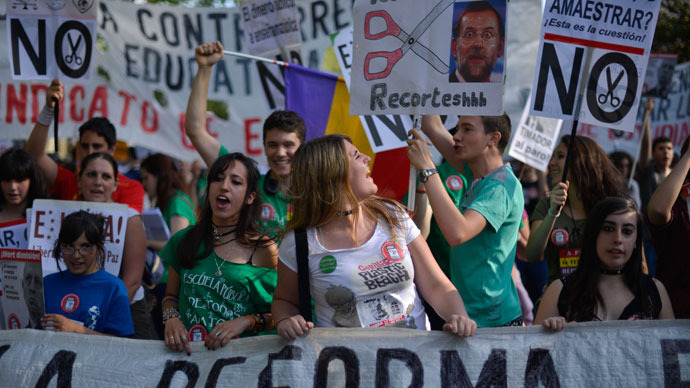 Protesters, many wearing the green T-shirts that have come to be identified with the education-advocacy movement, marched towards the Education Ministry, calling on head minister Jose Ignacio Wert to resign. Thursday’s action was said to affect all levels of education, and union pickets were visible across schools and universities throughout Spain. The trigger for the latest demonstrations was a set of changes to the country's education system, set to be approved on Friday, that would enact new grading systems, enact further funding cuts and place more emphasis on Catholic religion courses. According to Almudena Cabezas, politics professor at Madrid's Complutense University who spoke with the Associated Press, the new round of defunding would render an already strained education system inoperable. "Teachers are working in very limited conditions with less time and fewer teachers than before," said Cabezas. "Pupils are being harassed with tax increases and are having to cancel enrollments. Also, administrative staff are having their salaries reduced and are being fired... so I think we have every reason to be here today," she added. Having been in recession for the last four years, the cuts are only the latest austerity measure brought forward by the country’s ministry, which is still struggling to lower deficit levels to within European Union limits through a program of combined funding cuts to public programs and tax raises. The Education Ministry’s budget has already been cut by 14 per cent between 2012 and 2013, and the Platform for the Defence of Public Schools, which brings together students, teachers and administrators, has further been incensed in various regions by claims that new reforms would boost Spanish-language instruction at the expense of regional dialects. Historically, the country’s various regions have been prickly in their defense of regional languages, such as Catalan and Gallego, which were historically banned during its long dictatorship under Francisco Franco. Critics point to a conservative government educational agenda, which seem to be embedded within a larger aim to reduce the education system’s costs.